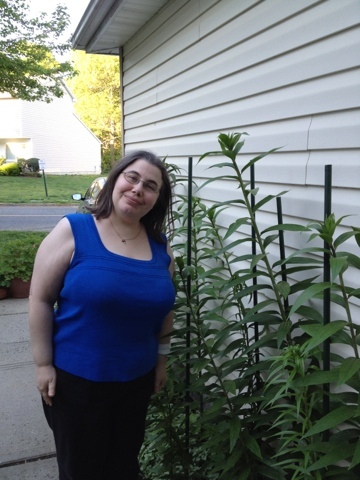 As of Friday, May 25th, my lilies are taller than I am. And I was wearing 1.5 inch heels when Brian took this photo. It's MAY! They're only supposed to grow to a max of 4 feet for the tallest variety I bought. 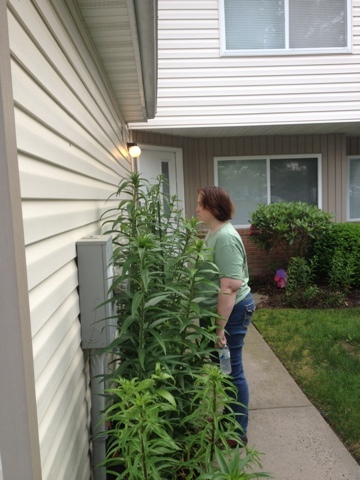 At this rate, they'll be up at the eaves when they bloom! So... Brian and I made a most awesome thrift store find this week. 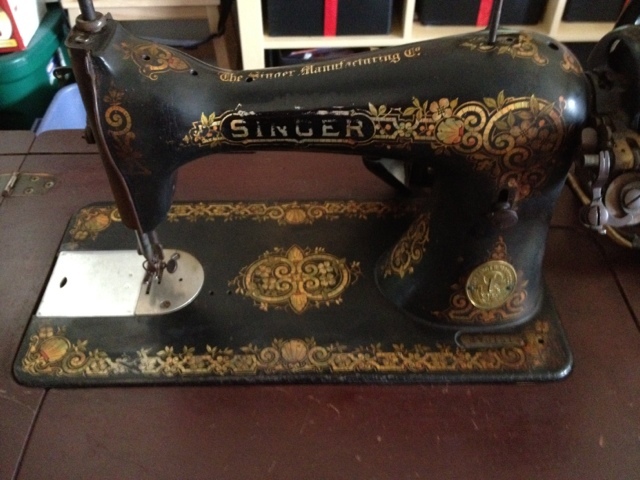 An apparently fully functional, in cabinet, OLD Singer sewing machine. For $30! SOLD! My "new" machine was made sometime in early 1910! It had an electric motor added at some point (possibly the 40's from what we've been able to find out), but the wiring is in such bad shape you couldn't pay me to plug it in. While online trying to find more out about it, I came across a twin, fully restored, functional twin. On eBay, but the seller was here on Long Island. A few emails later, and Brian and I drove out the North Fork and brought home the twin. I now know someone who fixes them as a hobby, is a wealth of information, and REALLY helpful. 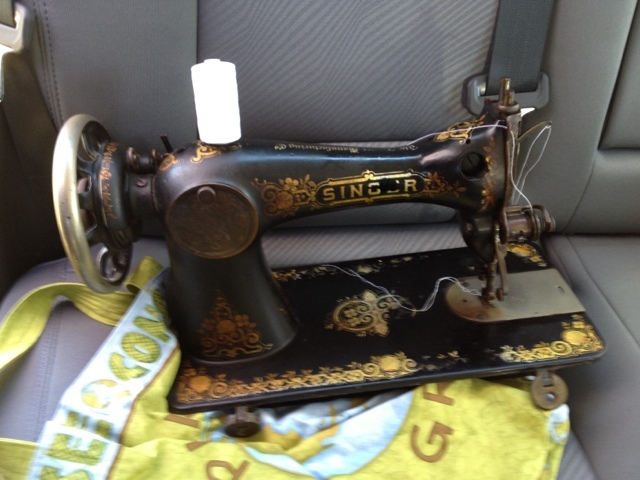 She also had the treadle base for the machine (the wood cabinet was severely damaged), and sold us that for a song. All I need to do is build a top for it and I will have a treadle machine too! 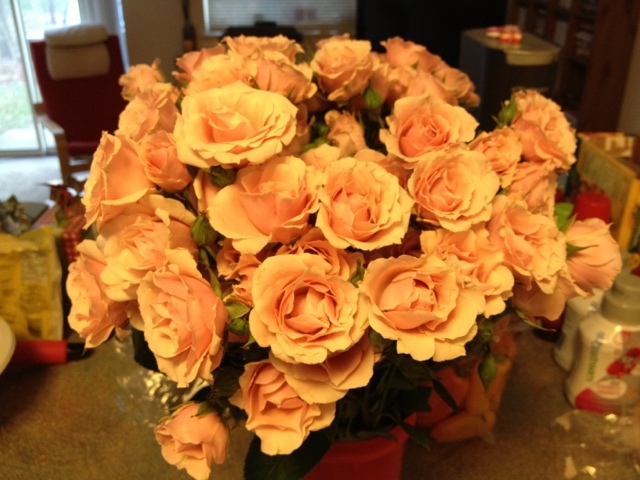 I am truly spoiled! In return, Brian got a stop at his favourite pie place in the world. That particular pie was peach, and so fresh we were warned to lift the lid once we got it in the car. :) Two other frozen ones also came home with us! This is from today's x-rays, and the neurosurgeon likes what he sees. He also (with some effort, ouch!) 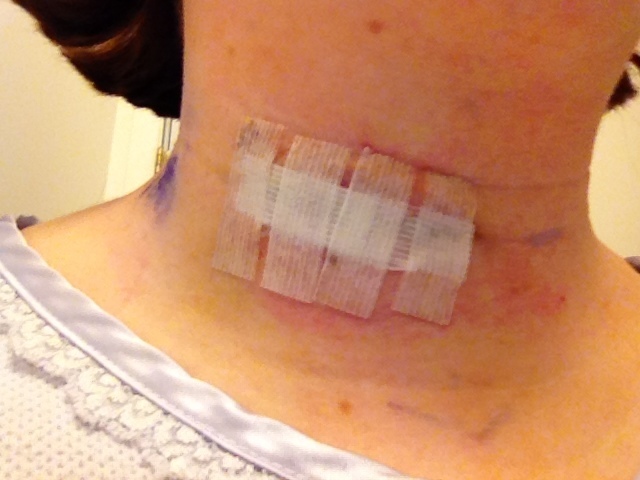 took off the steristrips, so I can see the incision now. 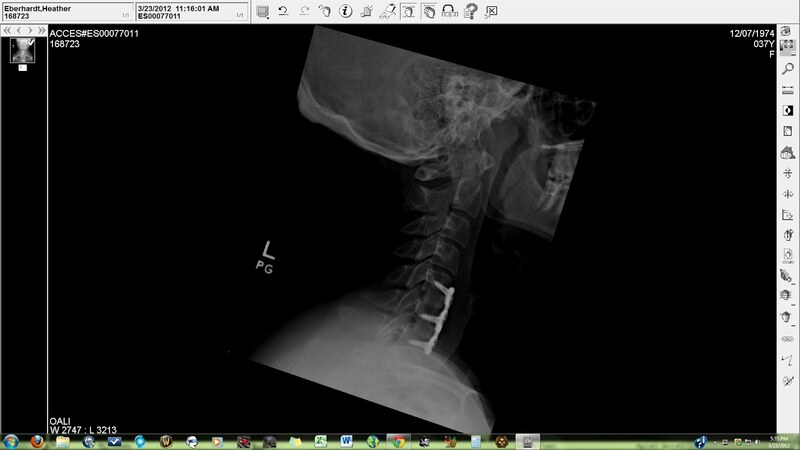 Not as long as it seemed from the mass of steristrips, so overall, no complaints! 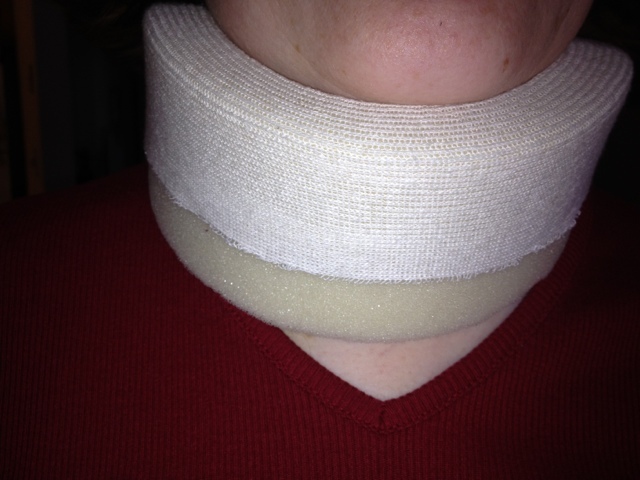 Another two weeks in the soft collar while PT rebuilds my neck muscles, then we'll evaluate when I go back to work. So longer off work than originally planned. Thanks heavens I have GREAT short term disability insurance! Spring is close enough to here! It&apos;s good to be crafty! 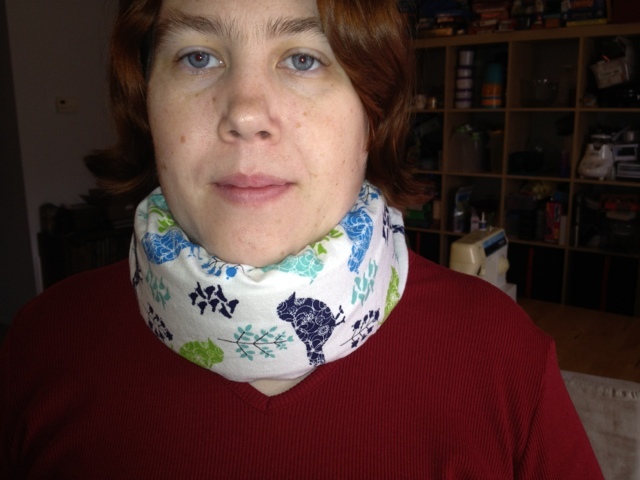 As part of healing from my surgery, I'm going to have to wear a soft neck brace for the next 3 weeks. They didn't have one that fit me properly, but were able to trim one down for me. Unfortunately, this meant it only had half the soft fabric covering, and had rough foam running on my skin. I also happened to have a soft, fuzzy remnant of flannel I'd picked up a couple of weeks ago. Ta-Da! 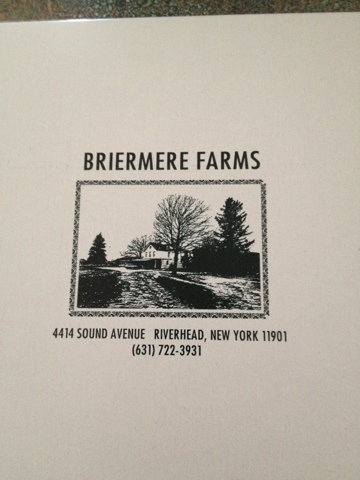 We went to Brian's favourite restaurant with friends on Sunday. 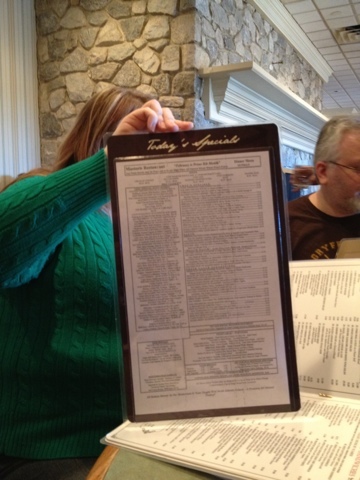 The page Tina is holding lists just the daily specials. There are an additional dozen pages or so of the regular menu. Many jokes were made about rolling to determine what to choose! Sometimes we need to just take time to remember that even with all the crazy stuff going on in our lives, we still have a pretty cool life. We had tickets to a taping Friday night of a comedian we like in the city. I took the day off so we could have a nice sleep in (I made it almost until 7am!) and take our time getting ready to go in. Just generally take it nice and slow and relaxed. What Brian didn't know was that I'd found a steal of a last minute deal, so we also had a hotel for the night, and lunch plans for Saturday with Friends at one of Brian's favourite restaurants! We had a great time, and made it home late Saturday afternoon, just in time for the Henagans' Madi Gras arty! More incredible food (I am so not getting on the scales) and another fun late night. Today we're hosting gaming as usual on a Sunday, and tomorrow we're meeting up with another friend just to catch up. I think I may need a vacation from my long weekend! Since my dentist is as big a geek as I am, he very kindly let me have a copy of the video of what the plan is for how my teeth will move over the next 13 months. Each "step" in the video is two weeks in real time, and another set of retainers. Wheeeee! 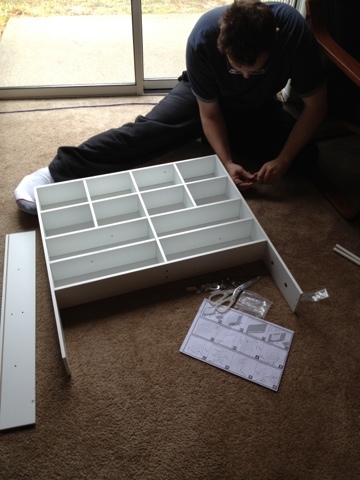 This is Brian putting together the craft organizer I bought for myself and then realized I couldn't assemble. In September! I'm getting ready to put my night guard in for the last time. 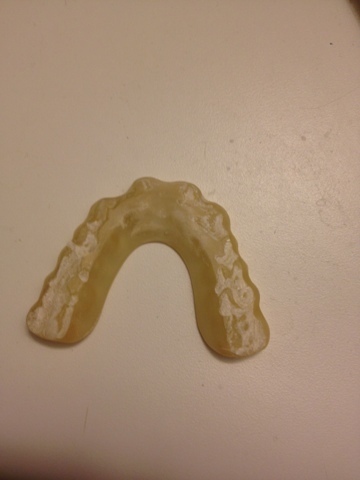 It has saved me much pain, many headaches, and much wear and tear on my teeth, judging from the marks! But tomorrow it will become useless as I am getting my braces! It's taken me ages to get to this point, and I am super excited about it! First, the WTF? So... there I was driving to work yesterday morning, minding my own business, but running a little bit late. Traffic ahead of me came to a stop, and so did I. Unfortunately the guy behind me? Not so much! That'll teach me... I was rear-ended on the Long Island Expressway. I'll be okay (loads of soft tissue damage and accompanying soreness, but nothing major), but the sheriff thinks my car is likely to be a total write off. Poor car :( OTOH, cars can be replaced, and I'm a lot harder to do that with! So, that kind of put a bit of a dent in my plans for today. I had planned to get the garden fully planted. But Brian came to my rescue and helped with most of it, and there are lots of photos below! Hopefully there will be some good eats here this year! I recently bought an eye-fi card for my camera, and hope it will make posting photos a lot easier. 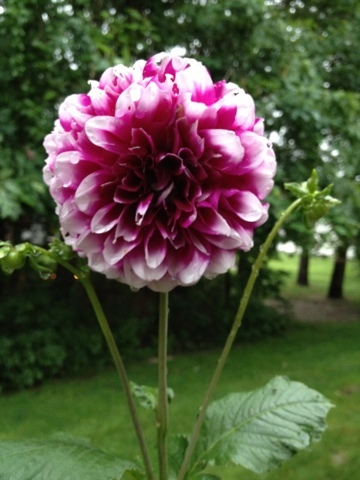 For now I've started a picasa account (username heather.eberhardt) to which I can auto-upload photos. If I've done things right, the title of this post should take you there! This time, in a good way! Brian has been looking for work for quite a while. He's not happy where he's working, and wants to change it. But it's a VERY tough job market out there. So he'd pretty much let it sit on the back burner for the last couple of months. So now, while NOT actively pursuing the hunt, he has two interviews next week. One of which is actually the third, and final interview for a great paying job, but NOT very close to home. The second is not as nice a job in case of career or pay, but much closer to home. And they pay is still more than he's making now. So keep your fingers crossed for him please and think good thoughts! So Brian has decided he's going to run a half marathon, and do it as a fundraiser for the Alzheimer's Foundation as a fundraiser in honour of his grandpa. He'll be running it in January with friends at Walt Disney World. In the meantime, he has some training to do. This is him just now on the couch after his first 8 mile training run. EIGHT miles. Phew! But the part that made me grin the most was the random shirt he grabbed without looking to put on. It's one of the ones I've made for our Disney trips. We had another crazy busy weekend, but it was worth every minute of it. We went upstate for our friends Johnny and Alisen's wedding at Mohonk Mountain House in the Catskills. It was a lovely wedding, and the venue was INCREDIBLE. The road up to the resort was certainly fairly white-knuckle inducing! We drove up to the area Friday night with Saul, Carrie and Yvie, as Saul's parents had generously allowed us to stay with them Friday night. The rooms at Mohonk were $570/night!!!! We had a lot of fun, Johnny and Alisen are firmly married, but we decided to leave in time to get down the mountain while there was still light. Because neither of us are in any shape to dance, we didn't stay for the full reception after the wedding. 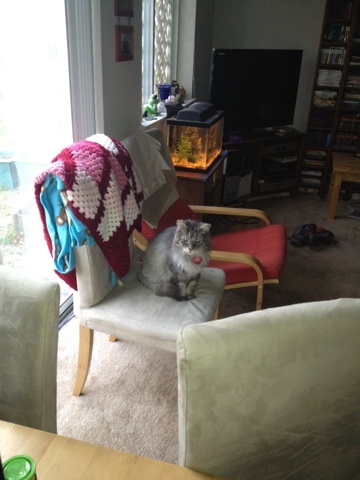 :( But to make up for it, back on Long Island, we had friends waiting to go out to dinner! We met up with Tina and Neal, who were here for I-Con, and a bunch of their friends. Dinner itself was a total bust (food barely so-so and service horrible), but the conversation, and new friends Keith and Wrenn more than made up for it! Sunday had been scheduled for a bunch of housework, but Tina, Neal, Keith and Wrenn managed to convince us to go out for linner with them before they left. I finally ate at the diner that other friends have been looking at holding DinerCon at, and now I totally understand why! It would be a perfect venue! Much hilarity ensued, Brian still can't get over the fact that something he said was live-tweeted, photos were taken* and everyone managed to still get on the road at a decently early hour. 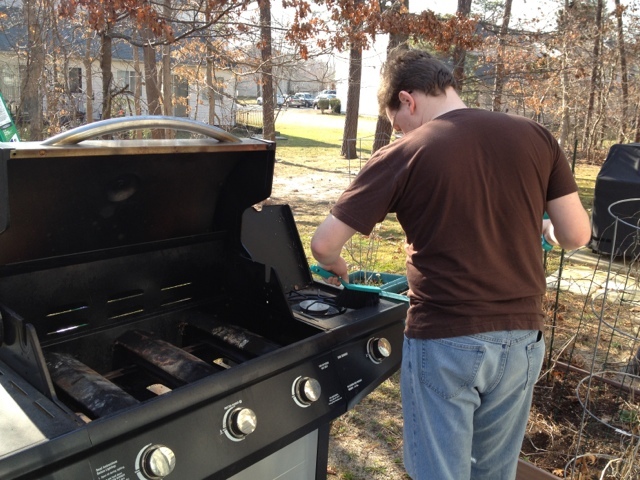 Today is Brian's un-birthday, and he's celebrating it by having a job interview this afternoon. He's not positive he wants the job, but it's still an interview, and worth doing even if he doesn't want it. The experience never hurts! *And none by me. 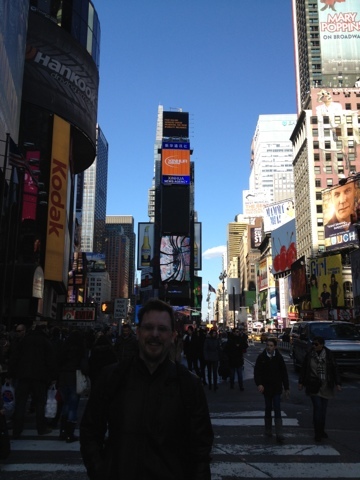 I had none of my usual cameras with me as it turned out, no camera, no cell-phone, no iPod! Strange! We went home to Canada for the weekend for friends' wedding. I'm so very glad we did, and the ceremony was lovely. We try to break the drive up into two parts each way, so after Kim's baby shower this afternoon we headed out. A little later on the road than we wanted, but not too bad. It was dinner time when we got to Buffalo. We strongly, strongly considered pushing on for Syracuse, but in the end decided to go for the early to bed, early to rise option. And for that, I am very grateful. The rain that was forecast to begin late tonight arrived early. It has already turned to SNOW. We would have still been on the road, and stuck with the crappy weather and trying to drive through snow to make it, late at night, to a hotel in Syracuse. Yaaaay for deciding to go to bed early. Which I am NOW going to go do.